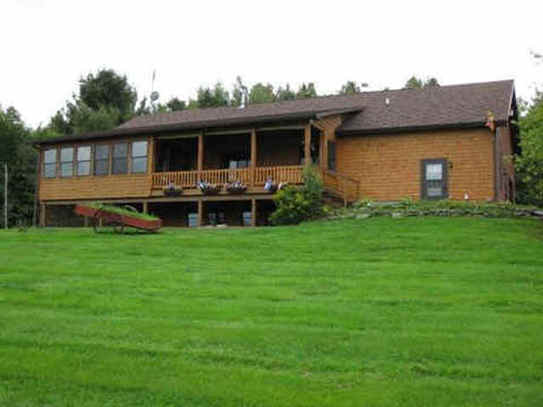 Enjoy the peacefulness of the countryside in this beautiful ranch style home. Knotty-pine walls throughout, the main floor offers a living room with a large, open layout and a gas stove. A dining room table for eight separates the fully-furnished kitchen with a breakfast bar from the open living area. Three bedrooms, two and a half baths and a large mudroom complete the first floor. The sun room and the porch swing provide beautiful views of the sunrise over the mountains. Satellite TV, games, books, and a DVD/VCR combo are available for use. The downstairs also has a full kitchen and living room with a TV, DVD player, and stereo as well as two bedrooms (one with a double bed and one with a double and a single), a full bath and lots of extra space. The vast property has a small pond where you can feed the fish and is bordered by acres of trees where you can wander at your leisure. This is the ideal home for a large or multiple family vacation: room for everyone to gather as well as find his or her own quiet place to relax. Conveniently located ten minutes from the Quebec border, fewer than 10 minutes to the mountain and only 1 mile to reach the Jay Country Store or the Jay Village Inn, you'll find The Green Farm a great place to relax and enjoy the best the Northern Kingdom has to offer. Washer and dryer. Towels and linens provided. Attached garage has ample room for outdoor gear.